This year, summer seems to have been fleeting. Where has it gone? You can feel a change happening. It’s dark much later in the morning, and sundown much sooner. There’s also that “something” in the air, that je ne sais quoi that is the harbinger for sweaters and jackets, and leaves turning red. I don’t want it to come any sooner than it will, but it is unmistakably there. The sun is not quite as “hot” as it was just a few weeks ago. We are now into the second half of August and, except for a few notable exceptions, I don't really remember this as much of a summer. It seems to have been just a blink of an eye ago we were celebrating Victoria Day in May. And now Labour Day is soon upon us. There has to be more summer ahead, right? The hot days will still be around for a while, fingers crossed. In Nova Scotia's defence, we do have glorious, long autumns. Warm, languid days filled with sunshine. Or at least it better be. Our spring this year was cold, short and brutish. This recipe is for those long, sun-washed days. Days when it’s still a little too hot in the house to have the stove on for long. These paillards only take about 2 minutes per side to cook. That’s pretty quick. If you’re not familiar with the term “paillard” it’s an old French culinary term that’s falling out of use, being replaced by “escalope.” Basically, it’s pounding the bejezus out of a piece of meat until it’s very thin, so cooking time is very, very short. I like the older term. I like history. Although these were cooked in a frying pan, you could as easily do them on the barbecue. But if doing so I would recommend using a sheet like one for veggies. The paillards are too thin to be efficiently handled any other way. And baste each side lightly with melted butter. Regardless of cooking method, in the end these are fast, and a little impressive, for a warm day. So bring on summer, right? 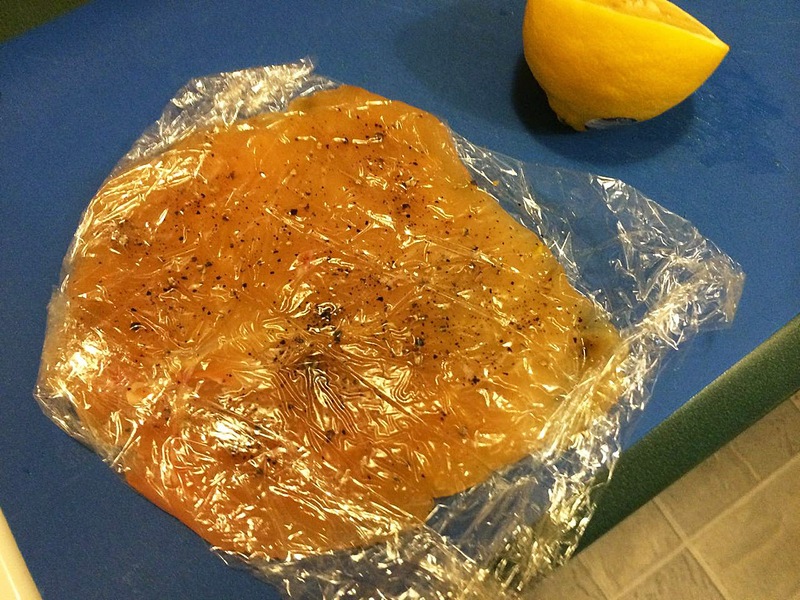 Place one chicken breast at one end of a long piece of plastic wrap. Fold the wrap over the top and (gently) pound the breast to about 1/4” thick. Season the chicken with salt and pepper on both sides and re-wrap in the plastic. Set aside until ready to cook. Repeat with the remaining three breasts. The paillards can be made the day, or even a couple days, before and kept on a plate in the refrigerator. Just before cooking the paillards, assemble the salad. 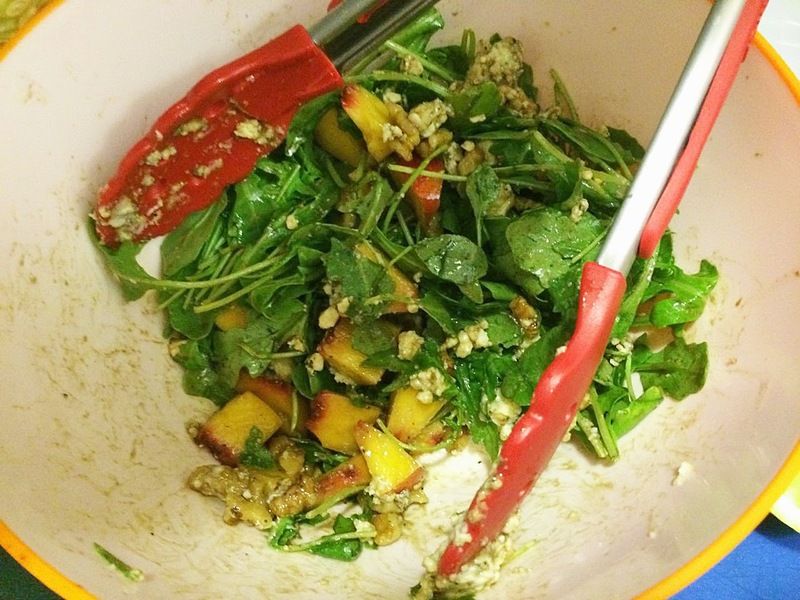 Cut the peaches into easy to manage chunks and add to enough arugula for 4 salads. Crumble the blue cheese on top and toss in the walnuts. Mix the salad dressing ingredients in s small jar and shake well. Pour over the salad and toss well. Melt the butter in a frying pan over medium high heat. Fry the paillards one at a time, for about 2 minutes per side, until browned slightly. After the paillards are cooked, squeeze the juice of 1/4 lemon on top of each one. 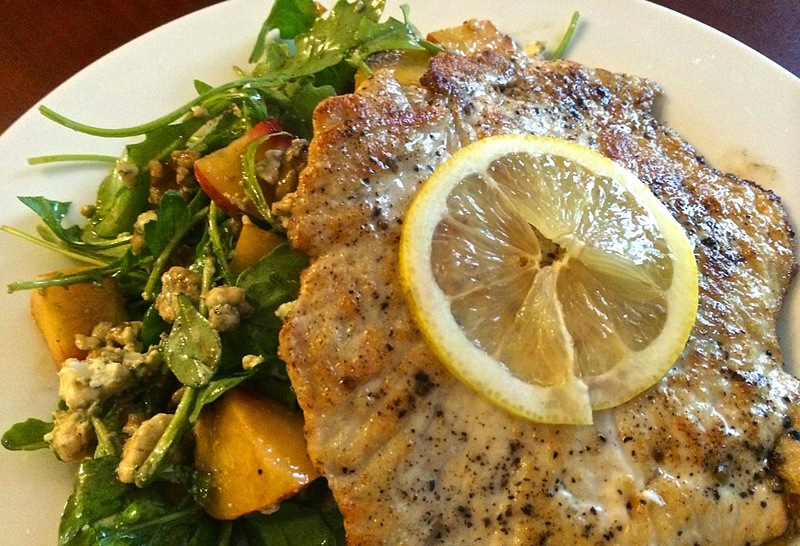 Serve with the salad and enjoy! i make paillards a lot. this is a perfect summer meal! i can't wait for fall!! !